Perhaps the definitive B&O product. Combining innovative, cutting edge technology, precision engineering, superlative performance and outstanding appearance in a tasteful, usable, relevant package, it set the standards for top end Hi-Fi. For a small organization like B&O to release a product like this stunned the audio industry, who were used to seeing a lead from the likes of Technics and Sony. Both these companies, and many others besides, tried in vain to imitate the Beogram 4000, but none ever offered a convincing alternative. Text copyright © Beocentral. Unauthorised reproduction prohibited. The Beogram 4000, as well as being a styling triumph, was a technical tour de force. The large and weighty platter was belt driven by an electronically regulated servo motor, when idler drive and induction motors were still the norm. The user could easily vary the speed within small limits, if for example, it was desired to accompany a recording with a piano in a slightly differing state of tune. Text copyright © Beocentral. Unauthorised reproduction prohibited. The controls were large flush aluminium surfaces, which were sequenced by digital electronics beneath, when most turntables still relied on levers and mechanical linkages. What really set the Beogram 4000 apart though was the arm. Actually it had two, both of which were moved under the control of an electronic analogue servo, at a tangent of a fixed angular relationship to the record, keeping the pickup at the same angle to the groove as the cutter would have been at when the master was cut. 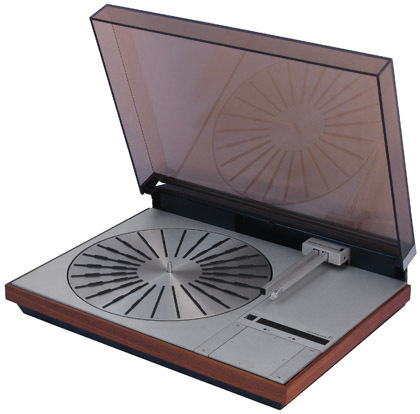 This system was known as tangential tracking, and remained in use with minor updates until the last B&O’'s last turntable, the Beogram 7000. The system had many advantages, including that it enabled the arm to be made very short and stiff, a great benefit. The use of dynamic balancing removed the need for a counterweight, and “optimum pivot point” (OPP) suspension was employed, making the arm shorter still. Text copyright © Beocentral. Unauthorised reproduction prohibited. The second arm, to the left of the first, served a novel function. At its tip was a downward facing light source and sensor, which could “see” the radial bars on the platter. This was used to automatically sense the size of records, as the electronics “knew” the distance between the arms. Thus the arm always lowered in the correct place, and the pickup was protected in the event that the machine was accidentally activated with no record on the platter, as the arm would scan in towards the middle, find nothing, then return and shut off. Assuming a record was found, the electronics were programmed to set the turntable servo to the right speed, though this could be subsequently overridden with the manual control for non-standard records. All Beograms with tangential tracking have two arms, but in later designs, from the Beogram 5005 and Beogram 3000 onwards, the second arm was to the right of the first, and only served to carry the speed indicator, record size being determined by weight. Text copyright © Beocentral. Unauthorised reproduction prohibited. During play, the arm could be manually moved using a control which took the form of a flat aluminium square with arrows pointing out at the edges, like the points of a compass. Pressing “north” raised the arm, so as to pause playback, and “south” lowered it, to resume. “east” and “west” moved the arm right and left, slowly if pressed lightly, faster if pressed firmly. If they were pressed while the record was playing, the arm would be automatically raised first, though it would be necessary to lower it manually using the “south” side of the control when the correct point of the record was reached. Text copyright © Beocentral. Unauthorised reproduction prohibited. The centre bearing, a massive assembly, and the mechanical parts of the arm control system, and the arm itself, were all mounted on a die cast sub-chassis, suspended from the main chassis (also die cast throughout) from steel wires hung on tapering single leaf springs. These three spring assemblies, adjustable for levelling, supported the sensitive parts of the record player, and effectively isolated them from external vibrations, be they from the loudspeakers or from dancing feet. This method of suspension, called either “pendulum” or “danceproof”, was patented and featured as part of all subsequent Beograms. Text copyright © Beocentral. Unauthorised reproduction prohibited. Such an advanced turntable needed a pickup capable of making the most of it, so the SP 15 was specially developed for it (see Accessories section). Such was the superiority of the 4000 that it was bought for use by people who did not normally buy B&O, and was used with all makes of equipment. To perform at its best though, a proper Beomaster receiver should be used. The 40 watt Beomaster 3000 of the period, perhaps with Beovox 5000 loudspeakers and of course a Beogram 4000, would have been a fine system indeed. Text copyright © Beocentral. Unauthorised reproduction prohibited. The styling of the Beogram 4000 is recognised worldwide as a masterpiece, and features in the permanent collections of many museums. Text copyright © Beocentral. Unauthorised reproduction prohibited.